I had fully intended to write a post about Charlie's new obsession - a bright green plastic spring - but recent developments have turned this into a post of another sort, about what happens to cat toys when they go to die. Truth be told, I first received the spring over the summer at BlogPaws in a goodie bag, thoughtfully prepared by our friends at Curlz and Swirlz... and Coffee Cats n' Yarn. Among cat food, a cool wooden top (also a big hit), and assorted other cat distractions, Charlie's paws down favorite gift was the tiny lime colored coil, simple in nature and measuring no more than two inches in length. "Springy," as he (yes, HE) is affectionately known has been MIA for quite awhile, along with Charlie's other favorite toy, "Witchy" - an orange ball with a bell inside, with a black witch's hat on its head and one eye still stuck on its face. Although he has tons of other beautiful, high quality (and non-missing) toys, this weekend I decided to go on a a quest to seek out his old pals, who were probably nestled away somewhere, just out of paws reach. Flashlight and hot pink yardstick in hand, I flatted myself out on the floor and made my first stop: under the stove. Lo and behold, among the dust bunnies and wayward fur mice, the little green coil emerged (Witchy is still on the lam). Charlie played with that coil all week, for HOURS on end, chasing it in circles and adorably toting it around in his mouth - and I spent no less than half of that time back on the floor, fishing it out from under appliances and pieces of furniture. Barricades were made; "Why are there tin foil boxes lined up in front of the stove?" 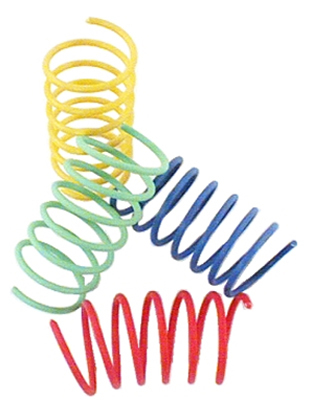 some may have wondered, but no matter what I tried, that damn spring kept finding itself in the wrong place at the wrong time. I planned on writing a post about Springy today, focusing on why Charlie is so obsessed with it, and asking, "Is your cat obsessed with something, too?" But as of yesterday, Springy has gone missing again - and I fear that this time it's for good. My favorite theory is that Priscilla is hiding him in her furry tummy pouch, just to make Charlie's life a little bit more miserable - but maybe like socks, cat toys like Springy and Witchy have their own secret portal under the stove or the couch, where they go to retire when they've had enough. An island, where they're allowed to bask in the sun alongside all of the other missing mice, milk rings, and hair elastics, secure in the knowledge that they lived a good life being the favorite toy of a little black cat in New Jersey who loved them so. I got a her a few packs from here http://www.purrsinourhearts.co.uk/shop/best-cat-toys/cat-toys-Interactive/Ethical-Pet-Colorful-Springs-10-in-pack so we always have extra ones for when she loses them. Every now and then we retrieve them, the cable ties and her favourites (the hazelnuts) from under the cupboards. Allegra and Ruby love their spring toys! Like Beth, I ended up buying two 10-packs and when we get down to the last two or three springs, I go on a spring retrieval mission. Do they have me well-trained or what! Oh, we clapped our paws when we read that one of your fav toys was sumthin we gave you! We loves the springs too and we get Teri to find them again when we lose them...mostly under the stove! So glad to hear we are not the only ones fishing under the stove for cat toys! It seems like they knock the toys under there on purpose. In our house its a toy we call "Purple Pink Pom Pom." It appears then disappears on a regular basis! I am going to be on the lookout for the spring toys for they look like they are a lot of fun. the spring is Cody's ALL TIME favorite toy and I have Ingrid King to thank for introducing him to it! He could play with those forever!!! I "paid it forward" by giving them to Brian along with a prize he won on my blog and he said that it is HIS cat's favorite toy too! I tend to find Cody's next to the fridge (between the fridge and the counter) did you check there? @Teri Thank you again soo much for the wonderful goodie bag!! @Georgia I was definitely starting to think he was doing it on purpose! @Caren & Ingrid What is it about the spring that makes it so alluring?? My kitties totally disliked the springy toys when we got some, but after they sat, unplayed with for ages, they suddenly became the BEST toys! And then a few days later, nope, they don't like them again. When our kitty went for her spay surgery, the vets gave her a yellow spring. She was obsessed with it and, you guessed it, kept losing it. I ordered a bunch of them online and then managed to finally find them in a store. She has about a dozen and they mostly go missing under the couch and armchair. Periodically I have to go on a hunt for them and find all sorts of other things as well. On the weekends, once I am up she starts meowing at me until I get her a spring from the cabinet (we hide them so she doesn't play in the middle of the night). Once I get it she wants to play fetch for as long as I keep throwing. She looks so proud walking down the hall with it in her mouth after I've thrown it. Silly kitty. I think that the evil missing socks from the dryer kidnap (kit-nap?!) the cat toys so that they have something to play with where ever it is that they go. Oh theese one is a good one! I wonder where Charlie's secret stash is...I have never seen a "springy"...must get my Human on this pronto! Also, I'm surprised to see hair elastics mentioned...I thought my cat was the only one obsessed with those things!